Even though Hecate is sometimes associated with all three phases of the Moon, she is, more often then not, connected with the third stage of the Moon, which is the Dark Moon. For that reason, she takes on the role of the Crone in a typical Triple Goddess formation in which there is a Maiden, a Mother and a Crone. Hecate has also been known as the "Queen of Ghosts," the "Goddess of the Three-Way Crossroads" and the "Goddess of the Dead," and it was there, at those three-way crossroads, that her followers held midnight rituals in her honor. She was also believed to roam the Earth on moonless nights, accompanied by her pack of hounds. The Dark Goddess, Hecate, has been around for as long as anyone can remember. She was definitely pre-Olympian, and most likely Thracian in origin. The Greek and the Roman pantheons each quickly cleaved her unto their breasts and made it seem, for all intent and purposes, that she was one of their own. What we do know, is that Hecate existed as least as far back as when the war began between the Olympians and the Giants. While the other Gods chose to live on Mount Olympus, Hecate preferred to live in the Underworld; sharing that place of darkness and death with Hades and Persephone, and with Khanates, Hypos and Orpheus, the Gods of Death, Sleep and Dreams. However, when Persephone was not on one of her three-month visits to the Underworld, she went up upon the Earth and Olympus, to take on her role as the beautiful Goddess of Springtime. Hecate had great powers of her own outside of the Underworld, since she was also the Goddess of the Night Sky. Hecate and Persephone were polar opposites of each other, and when they left the Underworld to travel up to the Earth, Persephone brought with her brightness and life, while Hecate brought with her darkness, and all of the things that tend to accompany darkness. It was Hecate who met the souls of the dead, and then led them into the Land of the Shades from one of its entrances at Lake Verna. When the souls of the dead went to enter the Underworld, they had to pass by Hecate’s sacred trees, the Willows and the Yews. Willow trees were believed to be extremely important to witches, since they supposedly were bound to them and helpless without them. It was in those hidden caves surrounding Lake Verna that witches would gather to summon the souls of the dead. The witches who worshipped Hecate usually did so at the three-way crossroads, on the very blackest of nights, and on her holy days, which were the Feast of Divine Life on September 21, Samhain on October 31, and on November 16, which was known as the Night of Hecate the Three-Formed. Hecate’s followers usually worshipped her by leaving offerings of food, rather then through sacrifice, which is what most people tend to associate with a Dark Goddess. Hecate's sacred color was black, and her sacred animals were the toad, a symbol of conception, and dogs; but more often then not, hounds. Hecate is yet another of the Greek Goddesses of the Moon, and she represents the third aspect of the moon which is the Dark Moon. She has been known as the Hag, the Crone and the Dark Mother, and it was believed that she had great wisdom and knowledge. She was also believed to be a keeper of secrets, and of mysteries. Hecate was known, as well, as a Huntress Goddess, and she frequently was depicted having the head of a boar, a horse or a dog. Many people believed that Hecate had the ability to control the spirit world, as well as the powers of nature such as birth, life and death. Another myth regarding Hecate was that dogs were the only ones that could hear her, as she traveled across the Earth in the dark evening sky. It is from there that the old wives’ tale comes from, which claims that when dogs bark at night for no particular reason, they have actually done so because Hecate had just been passing by. Some people have pictured Hecate as an Amazon Goddess, travelling about in a chariot drawn by fire-breathing dragons, while her powers of sorcery were believed to be the best in the world. As far back as the eighth century, B.C.E., Hecate was depicted in an ancient statue having wings on her back, and holding a snake in her hands. She was also believed to be a shape-shifter, who could change her form, or even her age, and rejuvenate at will. The most important thing of all, was that she was believed to have the ability to kill. Hecate was also known as Hecate Trevia, or Hecate of the Three Ways. She was given that name because her statues stood at the three-way crossroads. People would frequently leave offerings to her at those three-way crossroads, on evenings when the moon was full, and those offerings consisted of dogs, honey and black lambs. In the Homeric Hymn to Demeter, Hecate was one of the parties who were helpful in bringing Persephone back home. Zeus always had the greatest respect for Hecate, and he would frequently seek her counsel, whenever he had to deal with mortals on the Earth. When the Titans ruled the world, Hecate acquired a great many privileges, and Zeus had actually allowed her to keep them all. Hecate, however, had no desire for more then she had, even though those privileges gave her great power. When someone would pray to Hecate, and that prayer touched her, she responded quickly and in a positive manner. Hecate gave her help to whomever she pleased, whenever she pleased, whether she was granting victory in times of war, or simply sitting back and letting destruction prevail, each according to her own particular whim. Hecate was also known for the help that she gave to competitors and fishermen; but what Hecate can give, Hecate can also, just as easily, take away. That is the power of Hecate. A great many depictions of Hecate exist. Hecate was the Goddess of the Dark Moon, which is the third aspect of the moon. She was also the Goddess of the blackest of nights, when the moon was hidden, and she was frequently associated with deeds of darkness. She was also known as the Goddess of the Triple Pathed Crossroads, and as the Queen of the Night. When her festivals were held, at those places where the three roads meet, they became perfect times for divination and for communication with the dead. Hecate’s followers frequently worshipped her in the darkness, with only the flames of their torches lighting their way. During the early part of the Middle Ages, Hecate’s reputation as the Queen of the Witches grew in power, and she was usually envisioned in the role of a Crone, which role is archetypal of the feminine mystique. A popular belief during that particular period in time was that if these magical women had the power to bring life into this world then, as they aged, they would also gain the power to take that life away. It was for that reason that Hecate became, in no uncertain terms, the Greek Goddess of Magick, and since she became the Goddess of Magick, the connection between Hecate, death and the Underworld continued to grow stronger as time passed by. There even came a time when people were so fearful of Hecate, that they committed blood-sacrifices in order to remain in her good graces. Darker still, is the belief that Hecate was the patroness of a demonic group of vampires known as the Empusae. It was because of those particular reasons that Hecate became a Goddess of enormous intensity. It almost seemed as though it happened overnight, but from that time forward Hecate was worshipped regarding every kind of witchcraft, sorcery and enchantment that there was. It was then, as well, that Hecate became known as the patroness of Medea, and of many other witches. The cult of Hecate was one of the strongest cults in the ancient pagan world, and it was during the 11th Century, C.E., that the Christian Church condemned any person who made an offering to Hecate at one of those places where the three roads meet. In modern times, Hecate is more often then not looked upon as a Moon Goddess, and as the Queen of the Witches, although Wiccans, Neo-Pagans, and a variety of other Goddess groups still comprise many of her followers. Hecate appears in what might possibly be the oldest of the Triple Goddess formations, appearing in all three phases of the moon, but more often then not as the dark moon. That, however, is only the beginning; because when it comes to Triple Goddesses and Hecate, there is more; so much more. Hecate is a truly amazing Goddess, because she has been in, not only so many different Triple Goddess formations, and so many different types of Triple Goddesses, but also because of the many ways in which she is related to the magickal number three, triads, and things that happen to be tripled. First, let us first look at some of the more simple triads that reflect the triple nature of Hecate, which are indicative of her rulership over the three phases of the moon, and of her connection to the magickal sacred number three. 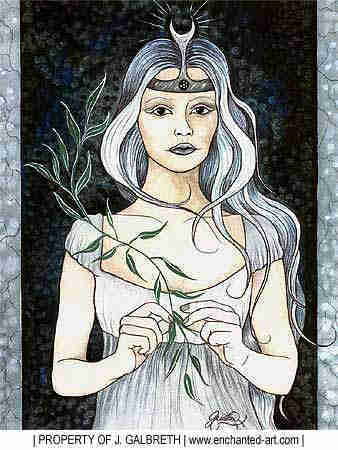 Some of these deal with Hecate's association with the three-way crossroads, with her celebration on November 16, which is the Night of Hecate the Three-Formed, with Hecate's tarot associations, which are threes and the High Priestess; and with the fact that Hecate represents the third aspect of the moon. These Triads also appear as the moon's cycles: as the new moon, the full moon, and the dark moon; and in the various cycles of life: as the Maiden, the Mother, and the Crone. She has appeared, as well, in the three realms: which are the Sky, the Earth, and the Underworld. What follows are perhaps the most interesting of all. They are the many ways in which Hecate can be seen as a solitary Triple Goddess or, in a different light, as a Goddess who is a part of a Triple Goddess formation. In Greece, Hecate was one of many Goddesses who were used in a variety of different combinations, comprising the original feminine trinity which ruled Heaven, the Earth, and the Underworld. In another of her Triple Goddess trinities, Hecate appeared as a singular Triple Goddess, in which she was a young girl, a mother and a crone, which are the attributes that are connected to the three stages of power in the Divine Feminine. It is Hecate, as well, who flourishes in a Triple Moon trinity, which continues to exist to this very day. In it, she becomes the Goddess of Three Forms, with the virginal Artemis/Diana on Earth, as the crescent moon; Selene, the pregnant mother, in the night sky, as the full moon; and herself, in the Underworld, as the Crone, or the Dark Moon. In her role as the Dark Moon, Hecate rules the darkness as the Goddess of the Dead and the Queen of the Night. A three-faced image of Hecate also existed, representing three separate aspects, and it became known as a “Triformis.” The Romans referred to this Triple Goddess formation as Diana Triformis, since it consisted of Diana, Persephone and Hecate. Hecate has also been associated with the Moon Goddess, Selene, who appears to be very similar in form to Hecate. In fact, Selena is actually so similar to Hecate, that their emblems and their triadic conceptions are almost identical. More often then not, these two Goddesses were considered to be interchangeable; and a prayer that was offered to one, was actually a prayer that was offered to either of them. This particular duality, which consisted of Hecate and Selene, had three heads, carried torches, and took on the role of the overseer of the three-way crossroads. Another triadic concept was known as Hecate Trevia, or Hecate of the Three Ways, and it was that image which guarded the three-way crossroads for many thousands of years. Even though the Greeks may have tried to stress Hecate's Crone or Underworld aspects, people continued to worship her in the exact same manner that they always had, which was at the places where the three roads meet. Hecate’s worshippers truly needed to be at those specific places, because it was there that they were able to perform their rites of magick. That image of Hecate, which stood at the three-way crossroads, looked in all three directions at the same time. That only helped to give Hecate the reputation for being an all seeing and all knowing Goddess. Hecate also appeared in another Triple Goddess trinity, as the Goddess of the Night, of the Crossroads, and of Life and Death. In earlier times, the Greeks also worshipped another Triple Goddess trinity, which consisted of Persephone as the Maiden, Demeter as the Mother, and Hecate as the Crone. Hecate has also appeared in a variety of Triple Goddess formations in which she had three heads, with each head being that of a different animal. The first of these formations consisted of the heads of a dog, a horse, and a serpent, while the second one consisted of the heads of a horse, a lion and a dog. Several other triple goddess trinities also existed, and they had three whole bodies attached to their heads. The third Triple Goddess trinity depicted Hecate carrying three heads, with each head facing in a different direction. In that Triple Goddess trinity, one of the heads was usually that of an animal, most often a horse, a dog or a boar. Hecate, Queen of the Night, Hecate, Triple Goddess of the Moon, Hecate Queen of the Witches, and Hecate, Goddess of Magick: these are some of the names that belong to this special Goddess since, believe it or not, they represent but a small fraction of all of her names. Hecate was, is, and always will be an extremely diverse and powerful Goddess, with the ability to do great good or great evil. Are there ever any dark nights when your dogs become extremely excited, but you know, or think you know, that nothing is wrong and that no one is out there? Will you wonder now? Will you? Could that possibly be that Hecate is passing your way on one of her many rounds across the dark night sky? Maybe; but if you ever find yourself at three-way crossroads, on the very blackest of nights, it might be wise for you to pray that Hecate grants your favor; and always remember to keep watching in every direction at all times.